Now that summer weather is starting, it’s important to protect yourself from the potentially damaging effects of the sun’s UVA and UVB rays. It’s also important to get enough sun exposure so your body can produce adequate Vitamin D. So, what are ways to make sure you get sun, without getting burned? First, as we come out of a time of year with less sun exposure, your skin will be more sensitive. Many people get burned the first time they spend time in a park in shorts, or the first time they take off their shirt and lay down at the beach to sunbathe. Remember to slowly, gradually acclimate your skin to the increased sun exposure. The time of day you are exposed to sun influences the angle the sun is coming through the atmosphere, with the strongest rays coming through between 10 am to 2 pm. An hour of sun exposure from 2 to 3 pm is not as impactful as from noon to 1 pm. 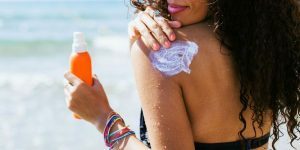 A recent study of sunblock lotion sold in the US indicates that most products offer less protection than consumers expected. Also, Hawai’i has recently passed legislation banning certain chemicals from all sunblocks sold in the state to protect coral reefs. This recent episode of Forum on KQED features an in-depth discussion of these developments and is great for those who prefer to get their information by listening. For those who prefer to get new information by reading, I highly recommend the Environmental Working Group’s resources about sunscreens. EWG is an excellent place to find out about the toxicity of anything you put in or on your body: make up, shampoo, deodorant, lotion, tap water, food ingredients, etc. Sunscreens should be your last resort. Sit in the shade, create shade by using an umbrella or wearing a hat, and wear clothing while in the sun to block out most of the sun’s rays. If you’re going to wear sunscreen, all active ingredients are in one of two groups: chemical or mineral blockers. The chemical blockers are not only less effective, but also have greater toxicity profiles. Many of the chemical blockers are endocrine disruptors, meaning that they interfere with the function of hormones in your body, with potentially serious effects, especially for future generations. EWG recommends that consumers especially avoid sunscreens with oxybenzone due to its toxicity. My recommendation is to only use sunscreens with mineral blockers (zinc oxide or titanium dioxide) which you’ll recognize as lotions that are applied as a white film. They may not be the most fashionable, but you’ll be sure to know where you’ve covered yourself, or your children, and everyone will know that you’re taking sun protection seriously.